Les Plus Beaux Villages de France - truly magical! Lets Start with Les Plus Beaux Villages de France in the Rhone Alps, shall we? Now I would like to share with you something about exploring France I have found very magical and particular…the idea of Les Plus Beaux Villages de France. The idea was invented in 1981 by Charles Ceyrac, Mayor of Collonges-la-Rouge and followed by 66 mayors and finally it was made official on 6 March 1982. 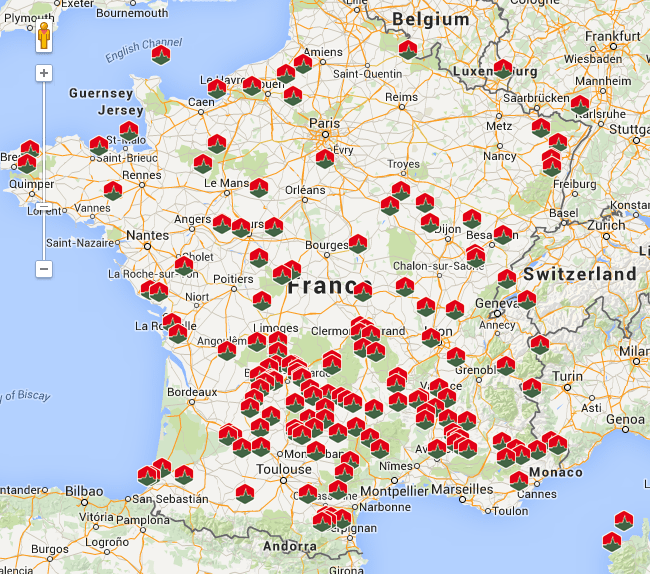 Today, the association includes 156 villages spread over 21 regions and 69 départements. A total of about 155 villages across France and two in Corsica have been given the prestigious ‘most beautiful villages of France’ award. It is so convenient when you want to find any particular one close to you and/ or explore any in a particular region of France. So, yes they are truly magnificent, unique – trust me as I have already visited a few, actually 6 so far and I want to see more! So lets start with the first one I have visited – Perouges – his medieval village located at top of a hill overlooking the Rhône plain is not so far away from Lyon. It is old, it has double enclosure of walls dated from 15C and 16C houses, amazing unevenly paved streets, and the fortress church etc. It has a unique atmosphere, very kind and welcoming and inhabitants and the city yummy speciality called Gallete de Perouges. It does not look and taste any different then a pizza with a lot of sugar 😉 ..as I would describe it…but you have to taste it. 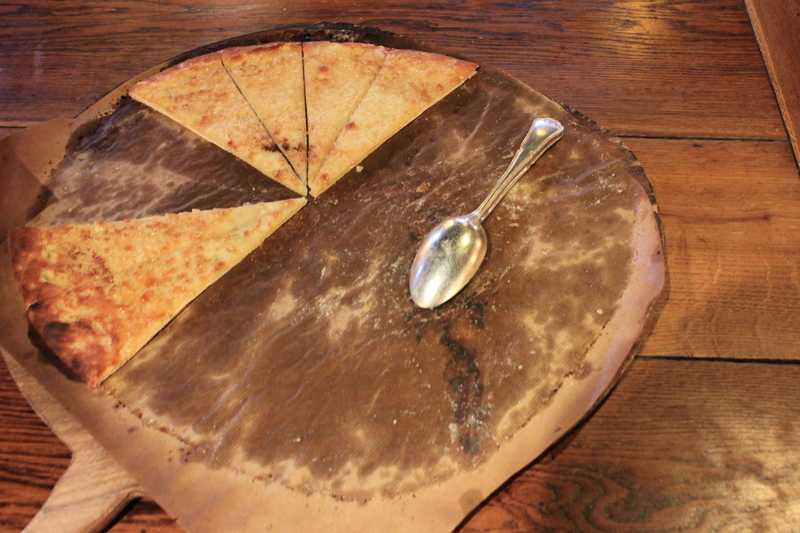 I am not sure you can duplicate this amazing taste when baking yourself but some people try and here you have a recipe of the Galette de Perouges to follow. But just go and enjoy it on a day out, it’s a nice treat and experience! If you have a chance stay for the evening as well as the contemporary lighting enhances the exceptional architectural unity and all looks stunning! If you want to find out more just visit Perouges Tourism Center and if you don’t belive me, read the opinions of others! La Garde-Adhemar is located along the crest of a hill to the south-west of the Drome department. This small and pedestrianised village, has a unique character and also very attractive views across the surrounding countryside and the Rhone valley. The village preserved in a very good condition quite a lot of its original defensive ramparts and two of the original stone gateways through the walls. La Garde-Adhemar is one of the best preserved medieval villages in the region. The Iron cross which you can see when entering the bridge is dated from the 18th century. As per typical Beauty Village of Franc, La Garde-Adhemar itself has a lot of small and cosy streets and alleys. Walking thought them you can admire all those interesting medieval houses. But what you are going to admire the most…is the lovely roman style Church of Saint-Michel. It dates from 12th century, has a beautiful bell tower which is equipped with double rows or round arches. It is noted that the upper level had been added to the church in the 19th century. I was very impressed with the decorative window and round chevet of the church. So, don’t miss them! Additionally to this, the church has been built in a quite unusual way. It has used two different techniques, a combination of ‘rough’ stone walls and ‘cut stone’ walls. Another unusual feature is its apse of the church. It is orientated to the west rather than the east site. This is not common with churches. That all and the view makes it even more spectacular! But what you are going to fell in love with when visiting La Garde-Adhemar, it is its botanic gardens. Within other towns in France the ‘medieval garden’ are frequently small and uninspiring, but not here in La Garde-Adhemar. They are extensive, with a very large range of medicinal and other plants and the added feature of having far-reaching views across the valley below – they are stunning and beautiful! Ok, I will move on as it seems I cannot stop going about La Garde-Adhemar! And there are more to come…well let me just briefly take you through Mirmande which is the last one (so far) village I have visited on the way to Lyon! 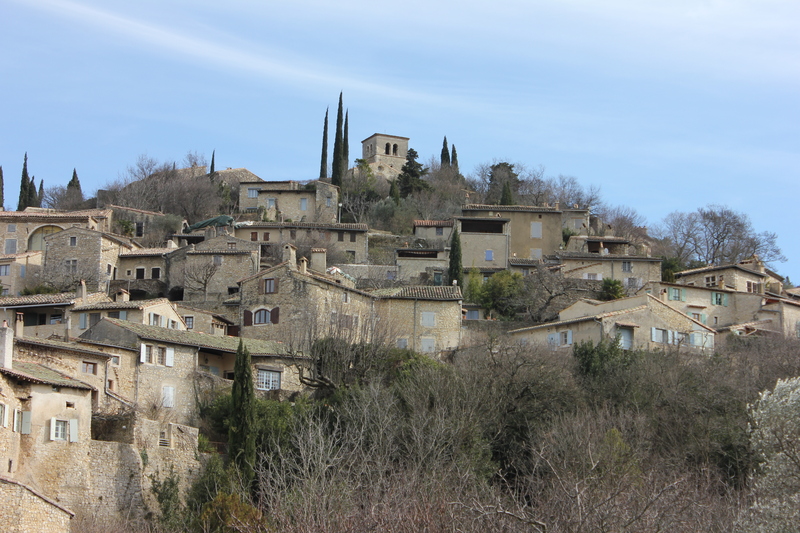 The village is situated 15 km north-east of Montelimar and 25 km south of Valence. Mirmande is not only the ‘most beautiful village of France’ but it has also won awards for its ‘most beautiful roofs in France’ . It specialises in plants and shrubs with decorative foliage and so that is why it gained another title – the one of “Villages Botaniques de la Drome“. Mirmande is a very small but so charming medieval village, set among trees, orchards and open meadows and with amazing views across the surrounding countryside. Its small so easy to get around and explore! Typically, it has many paved streets that run up the side of the hill or by following the remains of the ramparts around the village. The walk in the village is a very nice one…why…oh well, you can really see lots of interesting architectural details in the stonework around the doors and windows of the traditional cottages. The village is full of flowers and garden areas and numerous attractive little gardens which add so much colour to the stone buildings and town centre. And where there is a village, there is a church. This time you can admire reach the pretty roman style Church of Saint Foy and its cemetery at the very top of the hill of Mirmande. This church now used for exhibitions. There is another church below the village which was built later for the lazy ones who didn’t want to climb so high to pray… But the walk is worth doing as the views extending towards the Massif central and the Rhone Valley are magnificent! And additionally the walk is worth doing as when you wander through the village you can really see many relatively wide flat streets which are linked by lots of narrow streets and steep steps which lead to the hill. I loved exploring all of these narrow streets and admiring all those interesting houses. It’s a really pleasure. What I also liked about Mirmande very much were the views, the stones of the village and natural light. It attracted me as I love taking photos but it also attracts many local artists and potteries.